Northern Sun Mining Corp. is a past producer of nickel and is focused on the exploration, development and production of primarily nickel, together with lesser amounts of copper, cobalt and platinum group metals from its properties in Ontario, Canada. It owns and operates the Redstone concentrator near Timmins Ontario. Redstone is located approximately 29 km south-east of Timmins, Ontario. It was previously operated by Northern Sun with active mining taking place in the Upper Zone up until 2009. Currently there are 737,000 tonnes of Inferred resources grading 1.57% Nickel and 0.03% Copper in the Lower Zone. Proven and Probable reserves are estimated at 204,000 tonnes with an average grade of 1.05% Nickel. Mill refurbishment was completed in 2013 and re-opened as a toll-milling facility in 2014. The Hart nickel deposit is located approximately 6 km east of Northern Sun’s Redstone Mine & Mill complex. Hart has a reserve estimate of 1.5 million tonnes at 1.40% Nickel in the Indicated and Inferred categories combined. The Groves property is located approximately 15 km south-east of Gogama, Ontario which is about 150 km from Northern Sun’s Redstone Mill. This property has a historical non-NI43-101 resource of 500,000 tonnes of 1.5% combined Nickel/Copper above the 45.7m level in two separate zones. 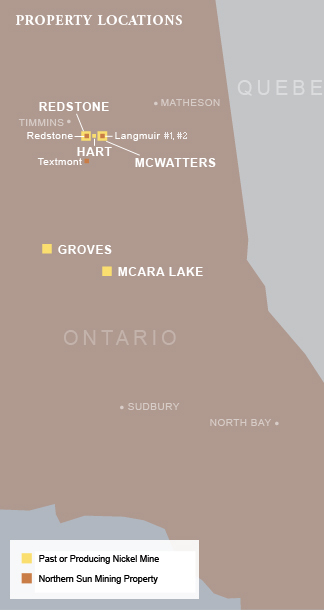 The Croxall Project is located approximately 4.5 km north-west of the Redstone Mine & Mill complex. Although minimal drilling has been done on this site, one historic drill hole from 2005 intercepted 0.63% Nickel over a drilled width of 3.34 meters. Recent drill results from the 2011 drill program confirmed the presence of nickel in this area with drill intercepts of 1.20% Nickel over 2.4 meters and 0.92% Nickel over 4.2 meters.